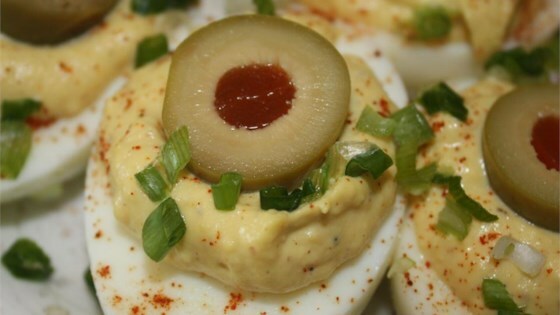 "Sugar and hot mustard are the secret ingredients in this much-requested recipe for deviled eggs. Whenever my daughter-in-law throws a party, she is always asked, 'Are you having your mother-in-law's eggs?' Mothers-in-law are known to be sweet and devilish!" Stir the mayonnaise, spicy brown mustard, hot mustard, sugar, salt, and pepper into the yolks until well combined. Spoon into a quart-size, resealable plastic bag. Snip a corner off the plastic bag. Save an extra clean-up step by putting all the ingredients to be mixed into the zip type bag, "massage" it all together and then snip a corner off & squeeze it into the egg halves. For me, it was like squirting brown mustard into my mouth directly from the bottle! Just not my style I guess. I took 72 of these eggs to a party ~ yes 6 dozen deviled eggs... They lasted 1 hour. I've been asked for the recipe so many times that I now go to parties with copies of the recipe.